In the same way that traveling to France should never be limited to visiting Paris, learning about its rich history and checking out some of its amazing architecture should never be constrained to a one-day visit to Versailles — there are countless castles in France that are mind-blowing, much cheaper, and less crowded. So, if you want to make your trip to France a little less predictable but still fill it with beautiful historical sights, leave the hordes of tourist sheep behind, hop on a train out of the capital, and hit these seven amazing castles. The Château de Chantilly is incredible for several reasons. First, it looks like it’s floating on the pond surrounding it — they don’t have that at Versailles. Second, it’s filled with amazing and diverse art pieces. Third, it’s less than one hour from Paris on the train. 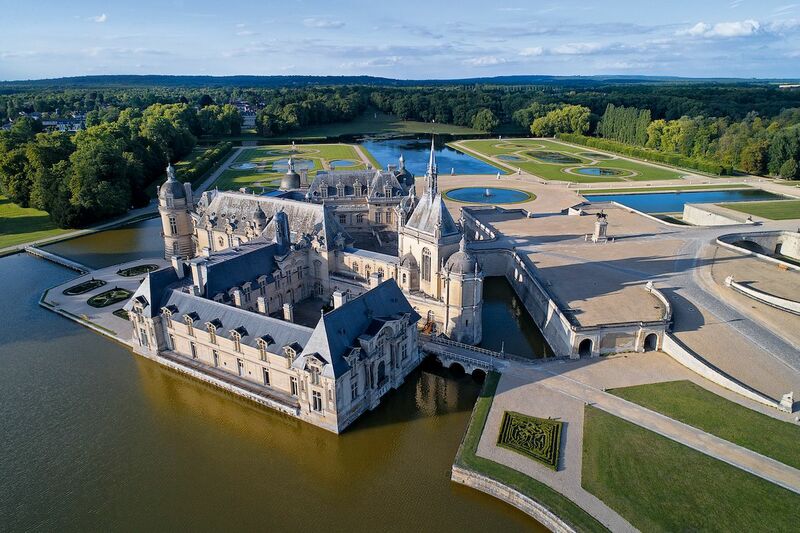 Henri d’Orléans, the son of the last king of France, rebuilt the Chantilly Castle in 1875 to make it the beautiful building that you see today. It turns out that good old Henri was a bit of an art collector, hence the fact that the castle now has the second largest collection of antique paintings after the Louvre. So, a visit to the Chantilly Castle is not all about looking at a very pretty building — there are amazing art galleries, beautiful stained glass, tapestries, lavishly furnished and decorated suites, a reading room that would make bibliophiles weak in the knees, crazy ceilings and wooden floors, etc. That said, when you’re all “arted out” head outdoors and check out the gorgeous French formal gardens and large park. Note that there’s also a beautiful museum dedicated to horses in the Great Stables and equestrian shows if you’re more into animals than paintings and flowerbeds. Prepare for your visit by checking out the official website. 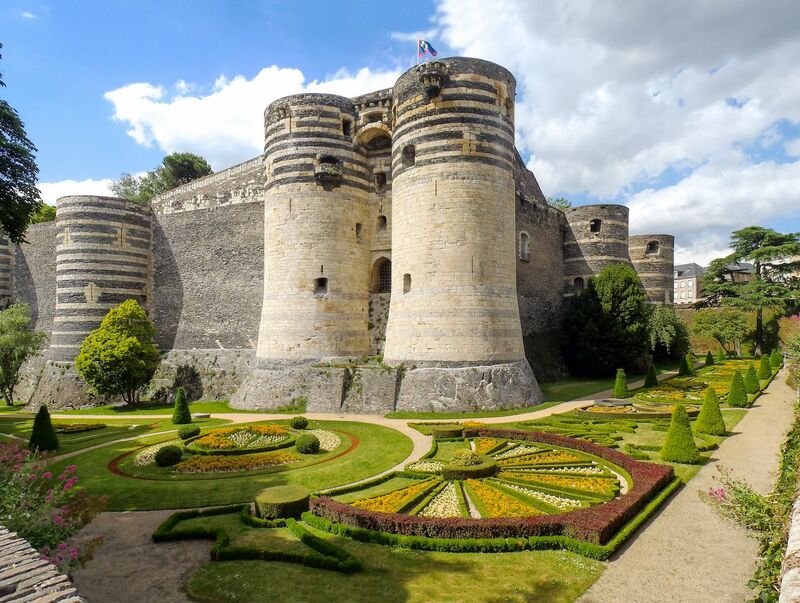 The Château d’Angers is a huge fortress of 17 towers. It may not look as refined as Chambord and Chantilly, but this 13th-century citadel is home to one of the world’s greatest art treasures: the Apocalypse Tapestry. The 14th-century tapestry is the world’s largest and oldest surviving medieval set of tapestries and a stunning piece of art. It is 328 feet long, made of colorful wool and silk, and kept in a dimly lit room where you can sit and look its details for hours. After you’ve had a good look at this masterpiece, check out the beautiful gardens outside and go up to the top of the fortress to take a walk and see an amazing view of the whole city. The castle is smack dab in the middle of the city of Angers, so once you’re done visiting, you won’t have to trek far to get a cup of coffee or hit a bakery for a pastry. Angers and its château are a two-hour high-speed train ride from Paris. 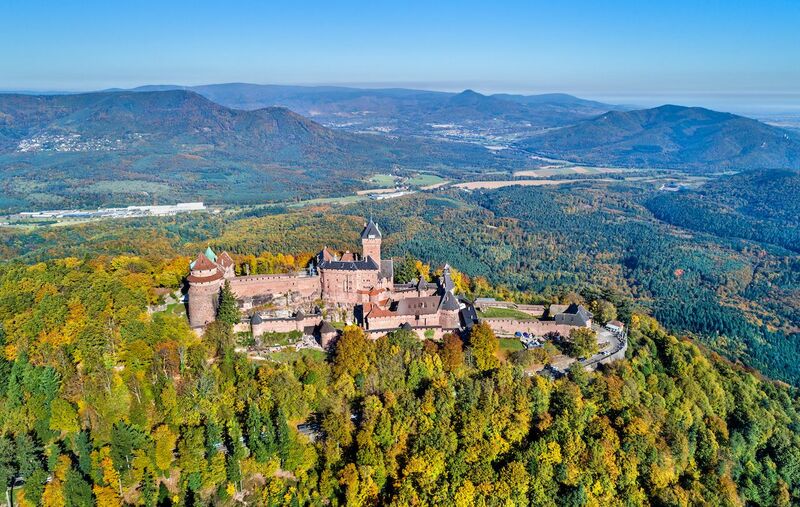 The Château du Haut-Koenigsbourg is a mountain fortress dating back to the 12th century. After being destroyed in 1462, rebuilt, besieged, pillaged, then burnt to the ground by the Swedish army in 1633, it was left in ruins for 200 years. When Alsace became part of Germany in 1871, Kaiser Wilhelm II decided to restore it entirely as a symbol of German power in the region. The restoration, done with extreme care so that the castle would look like it did back in the Middle Ages, ended in 1908. The Château du Haut-Koenigsbourg became a French property again in 1919 when the Alsace region was annexed to France after WWI. Check out the drawbridge, the three floors of the castle, and the Medieval garden, and make sure to have a good look at the exceptional views. Because it’s sitting 2,500 feet above the Alsace plain, you can see the Vosges mountains, the Black Forest, and even the Alps when the weather is clear enough. The castle is closer to the city of Strasbourg (a one-hour car ride) than Paris, but Strasbourg is only two hours from the French capital by train and is certainly an underrated spot that’s worth visiting. Check out the official website to know more about the rates, hours of operations, and how to get there. It took quite a while to get this castle built — 166 years, between 1519 and 1685 — but it was worth the wait. Although François the First, the king who commissioned the Chambord Castle, died much before it was achieved, he would certainly have enjoyed this magnificent edifice that he was planning to use as a hunting estate. The castle is immense and stunning inside and out and from every angle, as are the French formal gardens surrounding it. The most notable element of the building is its double-helix staircase located in the center of the castle, which two people can use to go up and down without ever meeting. This playful and mind-boggling architectural feature is said to be the work of Leonardo Da Vinci, with whom the King was friends. When you’re tired of looking at the architectural details of the castle, go explore the park around the property — it’s the largest walled and enclosed park in Europe — and keep an eye out for the wild stags, deer, and boards roaming the woods. 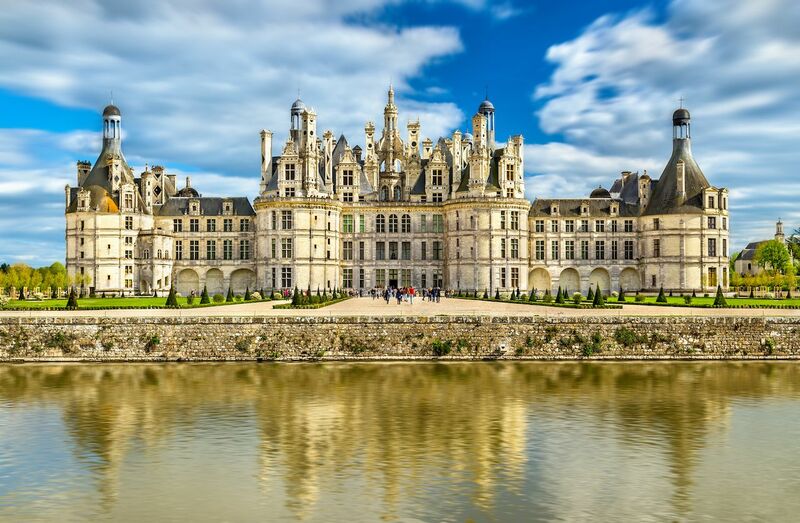 The Château de Chambord is a two-hour drive or 90-minute train ride from Paris. To plan your visit, check out the rates and hours of operation on the official website. 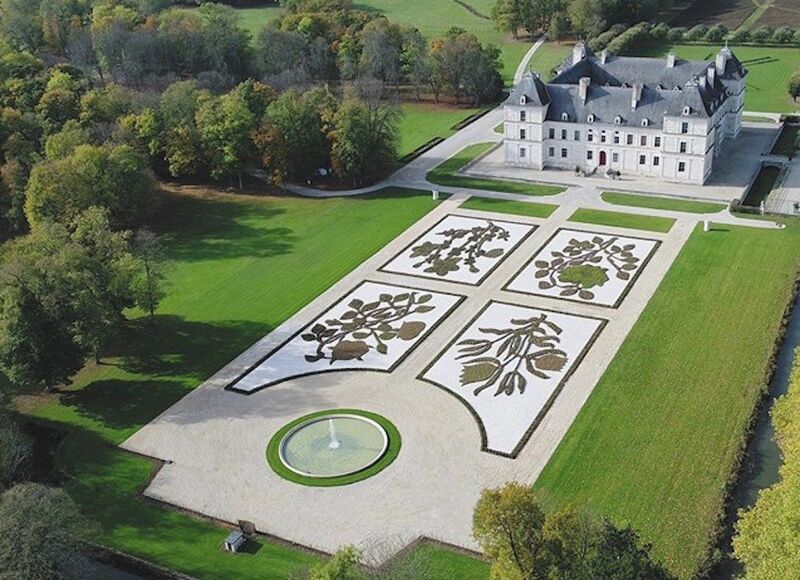 With its simple square shape, minimalist white facade, and small inner courtyard, the Château d’Ancy-le-Franc may look plain compared to some of the immense and ornate castles to be found in France, but it packs an unexpected punch. Only 20 years ago, the 16th-century castle was abandoned, and it was raining inside this incredible building. Today, after years of renovation and some amazing landscaping work, it’s a stunner — inside and out. It is said that its elegant inner courtyard was used as a template for the one at the Louvre — not a shabby reference. Inside, coffered ceilings, intricately assembled tile floors, and detailed murals make Ancy-le-Franc a masterpiece of Italian Renaissance architecture. But don’t stick to visiting the castle itself — there’s a 123-acre park surrounding it that you should take the time to see as well. 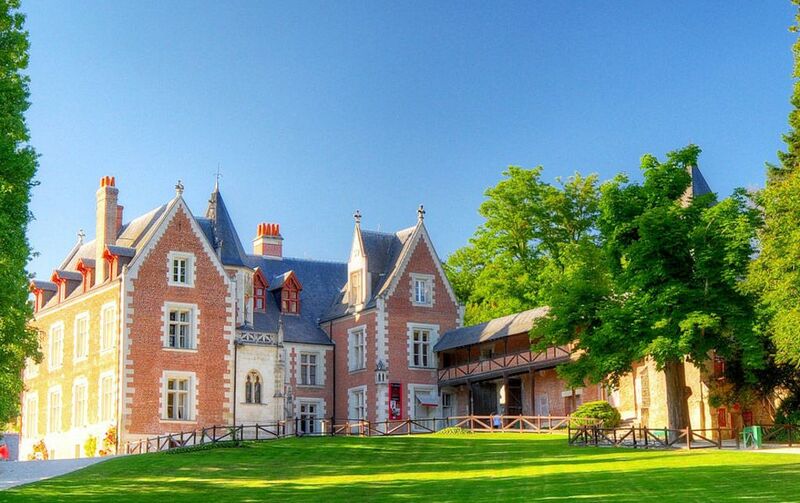 The Château d’Ancy-le-Franc is one hour away from Paris by high-speed train. For more information about rates and hours of operation check out the official website. The Château de Chenonceau was first built by a woman in 1513 and was embellished, restored, and protected by women over the centuries, hence its nickname “the Ladies’ Castle.” From 1914 to 1918, the castle was turned into a military hospital, complete with an operation room, an X-ray machine, and 120 beds for the soldiers in need of care. What makes this castle so unique and stunning is the fact that it was built above the Cher river, so take the time to look at it from the outside — it’s quite a sight. Inside, the chapel, the gallery, the kitchens, and the many other rooms are truly gorgeous — you don’t have to be an art expert to appreciate the level of details in the tapestries, ceilings, wooden floors, furniture, etc. While outside, check out the French formal gardens and the vegetable and flower garden, and have fun in the green maze. Splurge a little and book a table for lunch at the Orangerie gastronomic restaurant for a royal experience. 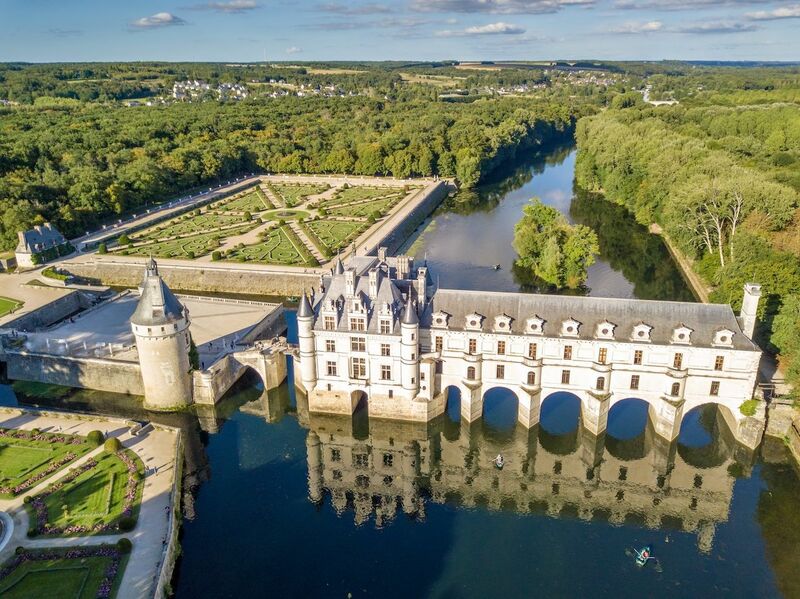 The Château de Chenonceau is only one hour from Paris by high-speed train. The Château du Clos Lucé is famous for being the home of Leonardo Da Vinci from 1516, until his death (at the castle) in 1519. Although the castle never belonged to the artist, the king of France had invited him to stay in this beautiful pink-brick dwelling. If you got frustrated by not being able to see the Mona Lisa properly at the Louvre because of the crowds, we suggest you check out this castle that celebrates the mind of Leonardo Da Vinci. The 12th-century castle and the park surrounding it are filled with the work of the artist and engineer, including paintings, sketchbooks, models of machines created according to his designs, etc. You can also visit his studio, as well as his bedchamber. The Château du Clos Lucé is also only one hour away from Paris by train. Check out the rates and hour of operation on the official website.